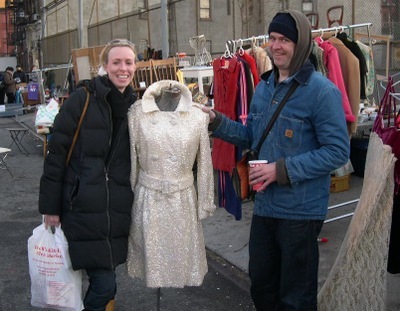 The Annex/Hell's Kitchen Flea Market is a destination for vintage clothes fanatics, and on a warm day in December, a sliver-sequined, hand-stitched, pearlescent trench coat was drawing a lot of interest. Especially from one blond actress. She tried it on–it was made for her, of course–then forced herself to walk away. She circled back, tried it on again; she walked away, wandered back. 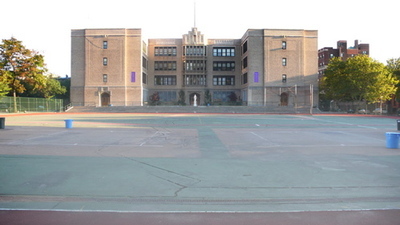 Since schools are less likely than parking lots to be decommissioned in favor of a new high-rise, partnering with a school's PTA helps give city flea markets some stability. 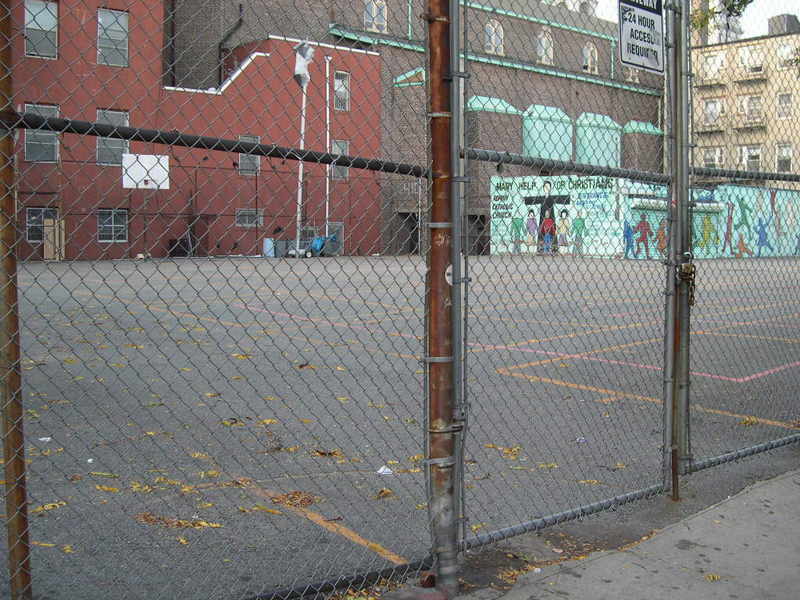 Such is the case with the Greenflea at Middle School 44 on the Upper West Side. 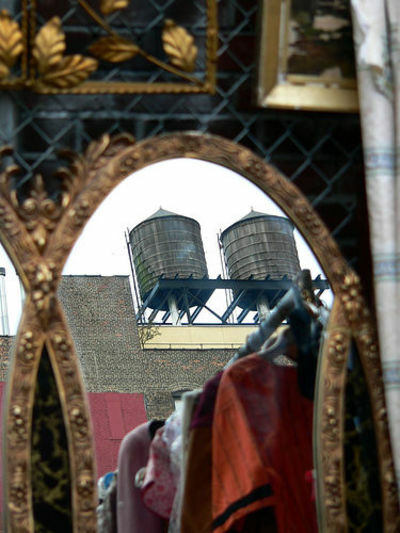 Watertowers reflected in a mirror at the last weekend of The Annex Flea Market, by the elegant anniebee. 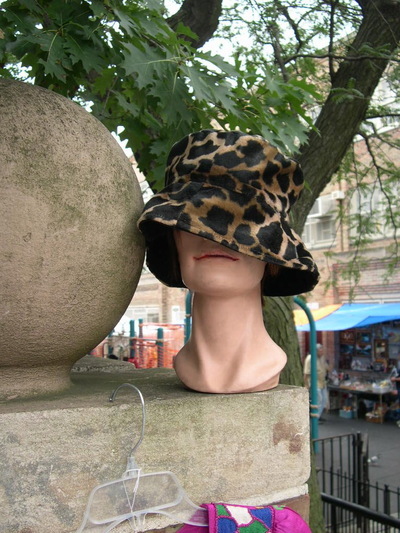 UPDATE: as of 2014, this flea is still in the same location, but is now run by the Brooklyn Flea and seems to be more foccussed on "family friendly." I visited P.S. 321 in Brooklyn on a bad day for flea marketing: temperature in the 90s, threat of storms, and the weekend in August before Labor Day. Everyone in New York except me and a few lonely vendors seemed to have been smart enough to get out of town. The goods were displayed on playground equipment in front of the building and leaned towards the description vintage and garage sale. 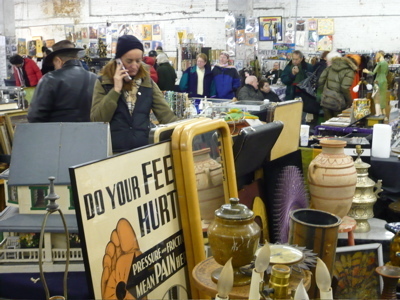 Michael Taylor at Accentiques (337 Flatbush), however, had promised that I'd find some interesting items, even some furniture, so this market might be worth checking out in better weather. 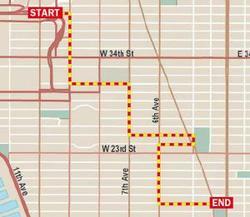 Seventh Avenue is the heart of Park Slope and a trip out here gives you a great chance to visit Brooklyn. That's according to its caption on Anniebee's Flckr site. The Chelsea Antique & Collectible Flea Market: Divine Intervention? Saturday and Sunday 5 am "until the last one leaves the lot." "If the Archdioces kicked us out, I'd march right down and talk to the Cardinal about it." So says dealer Pat Sweeney ("Ask Sweeney, tell it to Sweeney, sell it to Sweeney"). 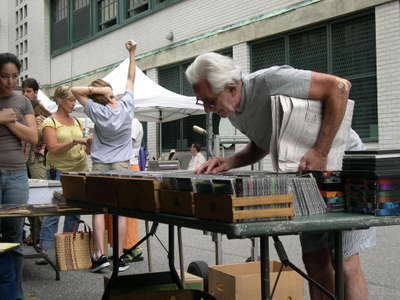 The Chelsea Antique & Collectible Flea Market is standing its ground against the vanishing of flea markets around the city by clinging to life in a small parking lot at Seventh Avenue and 17th Street. 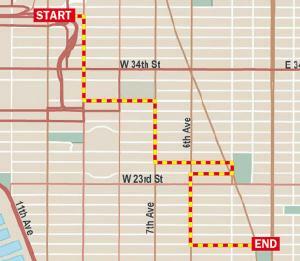 Three years old, and staffed by dealers displaced from the Eighth Avenue market, Sweeney is adamant that they're not going anywhere soon. The parking lot is owned by its neighbor across the street, the New York Foundling Hospital, a Catholic institution. The Mary Help of Christians sold out the Avenue B flea, but I guess the Sisters of Charity aren't tempted. Yet. 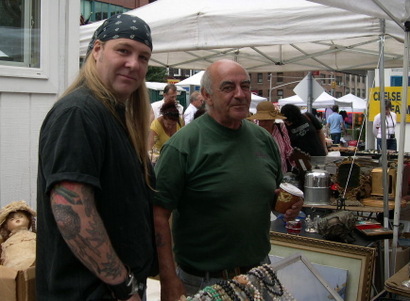 Pat Sweeney (at right) and fellow vendor. Dying? Dead? Hardly. After being told that few vendors were left, and remembering a dreary visit in the 90s where its condition seemed, at best, anemic, I arrived expecting to find this little flea on life support. What a surprise–the place was bustling. 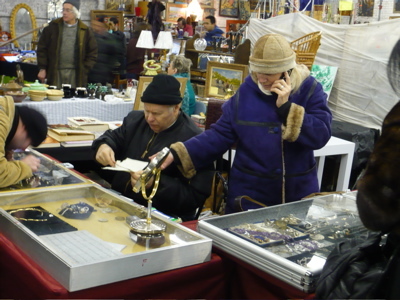 The goods tilt heavily towards vintage jewelry, but there were fewer crafts than at other markets, more satisfactory "old things" to browse through, and even at 5:00, with many sellers beginning to pack their wares, the market felt lively. 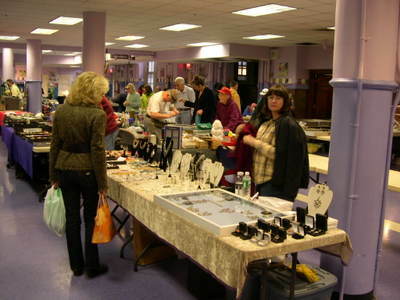 Many dealers enjoy a strong following. Bob, the market manager, pointed out one fine jewelry merchant with customers who have been coming to him for over fifteen years; some upper east side ladies stand by his table for two or three hours at a time on the weekend. 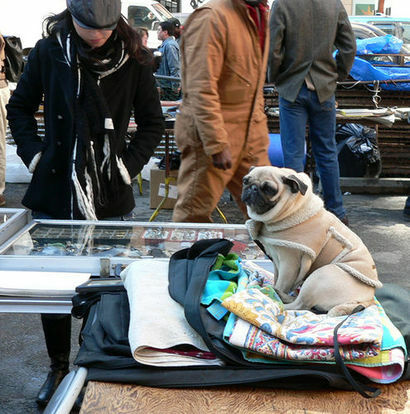 A celeb sighting always livens up a day at the flea market. "Gee, she shops for junk just like me!" 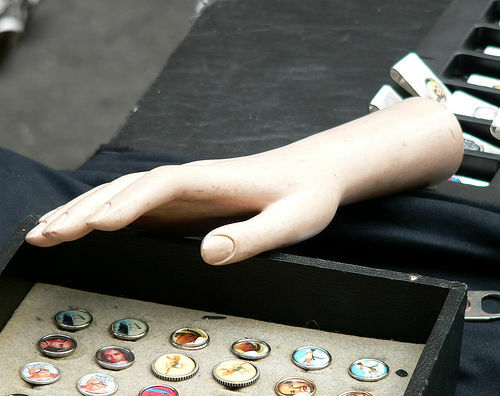 For the best odds in town, though, go to the Broadway Flea Market tomorrow, September 23rd, in Shubert Alley and West 44th Street. Costumes, autographs, scripts and photographs will be for sale, and you can stop by the Celebrity Table to rub shoulders with Bebe Neuwirth, Sir Ian McEllen, Bernadette Peters, and more (download the list of artists and appearance times off their website). Check out the Grand Auction, too, where you can bid for tickets and walk-on roles. The Altar Boyz van is up for auction, and the Altarholics are going crazy. I noticed that VIP seats to a John Stewart taping were starting at $400. Pssssst–you can request free tickets or even take you chances by standing in line–I know, I've been there. But let's not talk about that. The proceeds go to a good cause, Broadway Cares/Equity Fights Aids.